A habitat is an environment in which an organism, or group of organisms live in symbiosis. The environmental conditions on Mars are hostile for humans without life support systems; examples of the factors which make the surface of Mars uninhabitable include the thin, oxygen-poor atmosphere, the lack of easily available liquid water and the extremely cold climate. The habitat of any human visitor to Mars would have to be set of self-contained artificial environments, including settlement facilities such as buildings, rovers and space suits. The lower gravity of Mars is an environmental factor that may or may not be important in the long run. 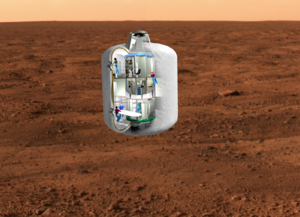 If the lower gravity significantly affects the viability of a Mars settlement, it might be possible to build part of the habitat on a centrifuge. However, this may affect the viability of a surface colony versus a rotating space habitat. First stage habitats: The initial habitats, made with elements from Earth, non permanent. Second stage habitats: The construction facilities for the next stage, permanent or non permanent. Third stage habitats: A permanent habitat, designed for long term use. 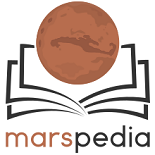 Fourth stage habitats: Habitat for a partially or fully terraformed Mars. Transhab a concept by NASA to produce inflatable habitats, producing more living space than traditional, solid habitats. This technology has been bought by Bigelow Aerospace, which is developing space hotels with this technology. A TB-habitat is a habitat constructed using a tunnel boring machine (TBM) ,roadheaders, drill and blast or cut and cover techniques. A TBM will have to be specifically designed for this purpose taking weight into account if lifted from the Earth’s surface and landed on Mars´ surface. This will diminish its cutting diameter. Alternatively, it can be made from local resources, allowing bigger diameters. This type of habitat is a 'third stage' habitat, as opposed to the habitat that will be used by the first party that lands on Mars. That habitat would be categorized as a 'first stage' habitat. And when a permanent ('second stage') settlement has been build, TB-habitats are to be used to expand the settlement subsurface in order to create really safe living and working rooms. The approach would be, to drill a grid of intersecting tunnels, each closed of at the ends by a air tight wall or, on occasion, an airlock. Within this grid, sections can be closed of with non-load-bearing walls creating dormitory rooms, workspaces, technical facilities, labs, social hubs, underground greenhouses, and so on. This approach requires the ability to make shotcrete(or gunite) on location. This means being able to make shotcrete from Martian regolith and available water. It probably will be necessary to strengthen the shotcrete with a spiral, winding steel wire. The tunnel will have to be able to carry the weight of the rock and soil above. And as Martian gravity is less than Earth's gravity, it will be physically less of a stretch to bear the weight. Added advantage would be that the occupiers would have no worries about solar flares and other types of radiation. It speaks for itself that the dimensions of the power supply, water supply, heating and air-conditioning are determined by the number of inhabitants, and the amount of vegetation. A fourth stage habitat necessarily comes after some terraforming effort, and therefore after the passage of up to a century of time after the initial settlement. This stage takes into account changes in the environment that modify the habitat requirements, possibly making some of the third stage habitats redundant. This page was last edited on 20 April 2019, at 11:03.